… Austin College has given to the world many worthwhile men; men truly great, who demand the respect and admiration of all. Their alma mater is proud, and justly so, of such sons. And in the future years may there be daughters of whom she can be equally as proud, is our earnest wish. One hundred years ago in the fall of 1918, many young men were on the frontlines in Europe rather than the classrooms of college. For the first time at Austin College, young women attended class as regularly admitted students. Women were not strangers to campus, as many had been welcomed as “special students” as early as 1890 through a cooperative arrangement with the all-female Kidd-Key College across town. Women had been campaigning across the nation for decades for the right to vote. 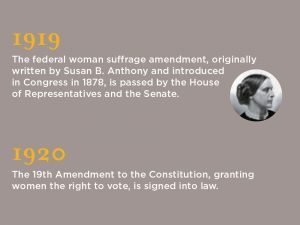 Texas became the ninth state in the country and the first state in the South to ratify the 19th Amendment on June 28, 1919. A year later, on August 18, 1920, Tennessee became the 36th state to ratify the amendment, completing the two-thirds necessary for the 19th Amendment’s ratification to the U.S. Constitution. 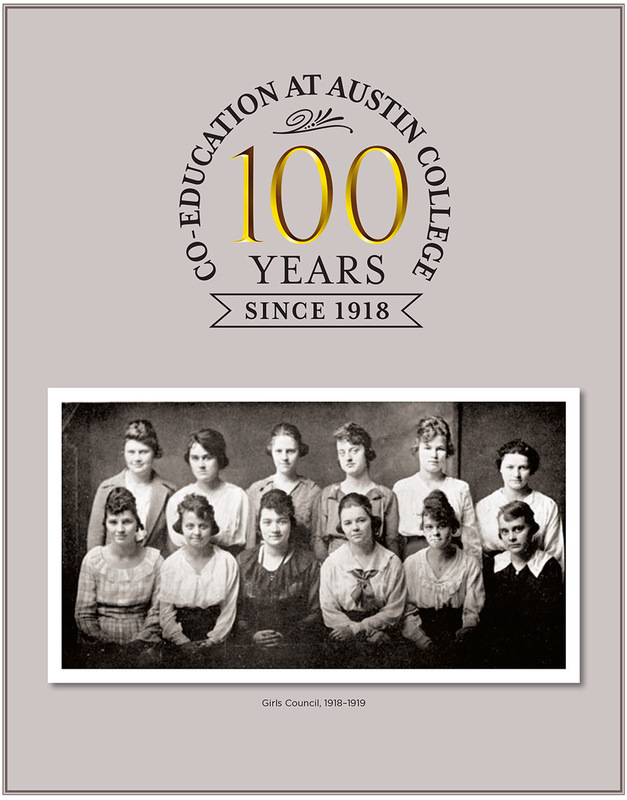 Austin College, along with other institutions of higher learning, was riding the wave of women’s rights, so the move to co-education was a natural progression for the school. The Austin College committee enthusiastically recommended the change, and it was met with only a little resistance from alumni and faculty in the name of tradition, and from some Shermanites in defense of Kidd-Key Women’s College nearby, which was having financial troubles. At one time, there were three all-female colleges in Sherman: Carr-Burdette College, Mary Nash College, and Kidd-Key College. Due to waning enrollment and economic trouble, all closed by the mid-1930s. That President Clyce and the influential English professor Dr. Davis Eagleton had daughters in need of college education when the committee was convened was probably no coincidence. So, once admission was open to women, their daughters enrolled. In that first year of official co-education, 22 women enrolled and brought with them a change in the campus culture. Traditionally, students had been referred to as “the boys,” and overnight, they became “the student body.” Of course, social life improved since picking up a date no longer required a trip across town, but rather just a stroll across campus. 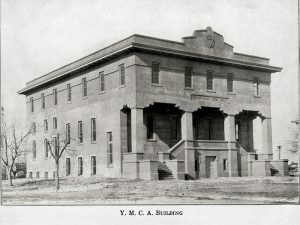 The women were housed with families in suitable homes around the perimeter of campus before the school converted the top floor of the YMCA to a ladies dormitory. In some cases, ladies preferred to live about a mile to the west on the campus of Kidd-Key College while enrolled at Austin College. “Although the women gained immediate acceptance in their classes, it took time for them to achieve full social approval on campus since a subtle prejudice against them existed in certain quarters,” Dr. Light Cummins, Guy M. Bryan Jr. Professor of American History, wrote in Austin College: A Sesquicentennial History. Some students, he wrote, resented having to watch their language or manner of deportment. 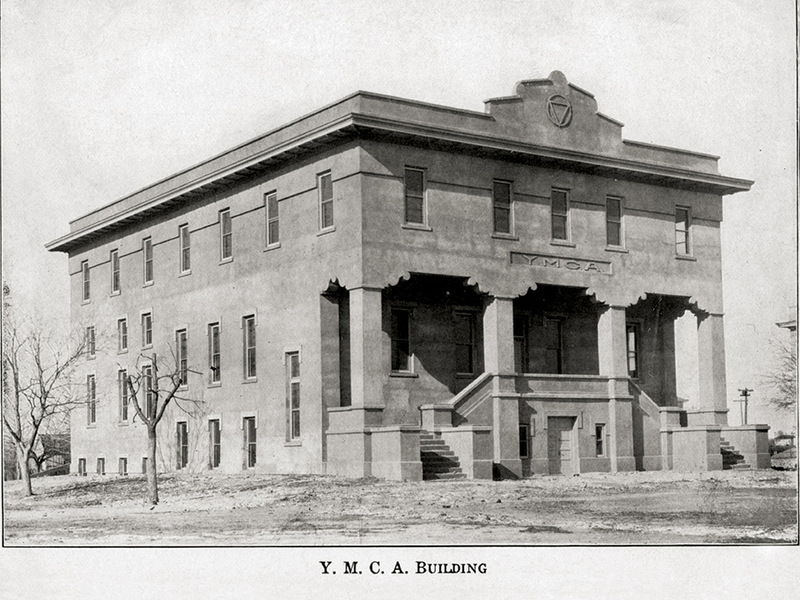 Of the 11 student organizations existing in fall 1918, only two permitted female members: the Athenaeum Literary Society and the Celina Club (students from that nearby town). The women felt they would have better opportunities with their own organization and founded Kappa Gamma Chi Literary Society to “promote literary study, personal improvement, and social progress.” The organization also became an important social outlet for the women, as did athletics. The women quickly organized a basketball team (1-3 record in the first year) and had a presence on the tennis team. They formed the Girls Council and nearly won the annual spelling bee. Rumors reported in Search for the Summit, a historical account of Austin College written by Dr. George Landolt ’27, suggested the female contestant “threw” the match out of fear of offending the male speller. While the social footing of the women students may have been uneasy, their academic standing was not. The announcement of the top academic ranking was a highlight of each spring term. In 1919, the top two positions were held by women. A third woman won highest honors in history, which normally came with a teaching role for the next term. Initially she was denied that offer as it wasn’t appropriate for a woman, but she prevailed, and according to Cummins’ book, became the first woman instructor at the College. The first women in the student body paved the way for future generations, and enrollment grew steadily, with women even becoming the majority during World War II when many men left for military service. Today, women slightly outnumber men in the student body. As of January, a female president and female vice president lead the student government. Women students excel in research projects and entrepreneurial ventures. They participate in all academic offerings and compete in Division III athletics in eight varsity sports. If there were a spelling bee today, they would compete fearlessly to the finish. Thanks to Dr. Clyde Hall ’47, professor emeritus of economics and business administration, for historical information and perspective. 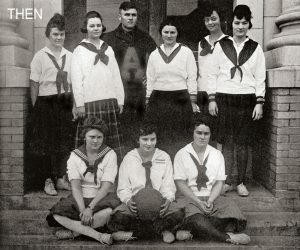 THEN: The 1918-1919 “Girls” basketball team included Jessie May Blaine, captain and forward; Ruth Simpson, guard; Grace Eagleton, center; Madge Murray, guard; Lola Belle Perkins, center; Iva Lee Blaine, forward; Sibyl Rudasil and Vallie Calhoun, substitutes; and Ewell Doak Walker Sr., coach. 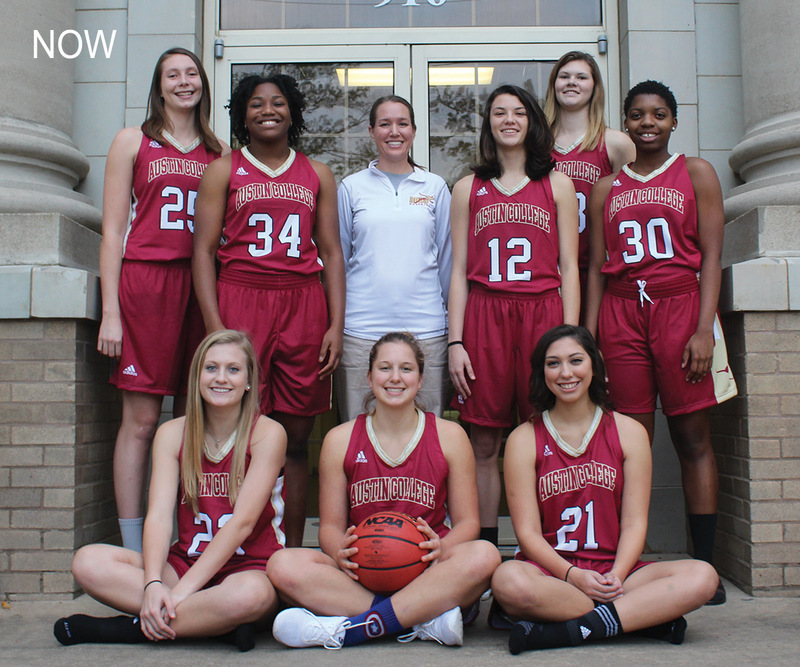 NOW: The 2017-2018 ’Roo women’s team includes Andrea Selkow, center; Precious Ogbuta, forward; Addy Walling, guard; Sierra Force, center; Melecia Young, guard; Jordan Kemp, guard; Reagan Chiaverini, guard; and Kendra Spangler, guard. 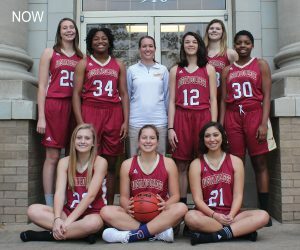 Unlike the 1918-1919 players above, who were the entire squad, these are only the youngest members of the 19-member team led by head coach Michelle Filander.